More than 40 experts from all sides of the debate were expected to testify on Friday and Monday, August 6, but there was no timeline on when the court could make a decision. 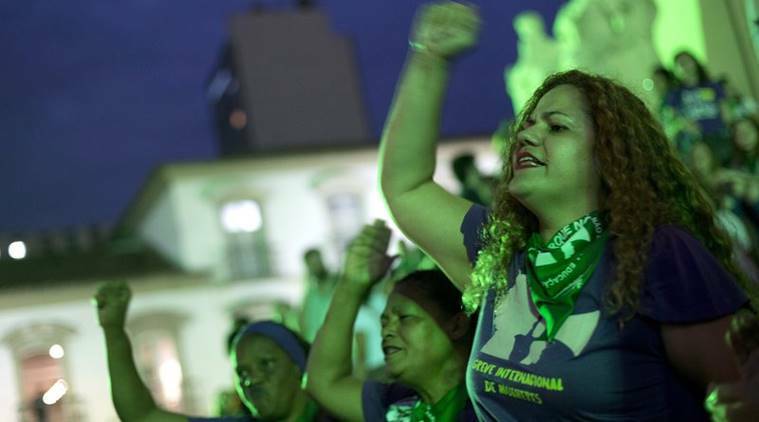 Rio De Janeiro: Supporters and opponents of legalizing abortion testified Friday in front of Brazil’s top court, an extraordinary session at a time when strengthening women’s movements are pushing against often decades-old laws in South America. The first of two expected hearings at the Supreme Federal Tribunal came just days before Congress in neighboring Argentina was expected to vote on landmark legislation that would radically alter abortion laws in the homeland of Pope Francis. In Brazil, a deeply conservative nation that is home to the world’s largest population of Catholics and fast-growing evangelical faiths, abortion is illegal and comes with a punishment of up to three years in prison. There are three exceptions: if a woman is raped, pregnancy puts her life in danger, or the fetus is brain-dead. The question before the court is whether to allow elective abortions during the first 12 weeks of pregnancy. Proponents argue that abortion laws, which harken back to the 1940s, are at odds with protections in the 1988 constitution, written after Brazil returned to democracy after a dictatorship. Similar to abortion opponents in many countries, in Brazil the central argument is that life begins at conception and ultimately trumps almost all other considerations. Debora Diniz, an anthropologist and law professor at the University of Brasilia, told the story of a black maid who, already struggling to raise three children, died from infection after several attempts to illegally abort her pregnancy. Citing a 2016 survey undertaken by the university, Diniz noted that 1 in 5 Brazilian women under 40 years old have had an illegal abortion. “The crime is how women are having abortions,” said Diniz, who earlier in the week said she had received threats because of her vocal position on the topic. Hermes Rodrigues Nery, from the National Association of Pro-Life and Pro-Family, argued that instead of helping the poor get abortions, concerned groups should focus on attacking the root causes of poverty and racism in one of the world’s most unequal countries. “The culture of death impedes our development as a nation, development that only comes from human capital,” he said. The thorny issue made national headlines last year when a Brazilian woman, Rebecca Mendes, fought publicly to terminate an unwanted pregnancy. Her petition was eventually denied by the top court, and she had her abortion in Colombia. The discussions in Brazil, Latin America’s largest nation, come as Argentina is on the cusp of allowing elective abortions in the first 14 weeks of pregnancy. A vote in the Senate is expected next week after the measure narrowly passed the lower chamber of Congress in June. In Brazil, numerous proposals to loosen abortion laws in recent years have failed to gain traction in Congress, where the so-called “evangelical bloc” exerts strong influence over social issues. Last year, a congressional committee approved a bill that would ban abortion in all circumstances, though it has yet to be voted on the floor of either chamber. While the topic is increasingly debated, it’s been all but a non-issue in the heated presidential campaigns ahead of general elections in October. In one form or another, all the leading candidates oppose abortion.